As a long term investor, I do everything I can to ensure that my returns are as high as possible over the long haul. What sort of things am I doing to ensure that I come out ahead? I'm doing my best to keep my investments diversified, and keeping the costs for my investing low. Typically people can see fees, commissions, expense ratios and account costs eat into their end returns, and it doesn't have to be that way. There are now free alternatives! I recently discovered a new hybrid brokerage and robo-advisor called M1 Finance. They give you the flexibility to invest in their preset portfolios using diversified ETF index funds, or you can invest in individual stocks, like with a traditional brokerage. Best of all, they're fee free! In this review we'll take a deep dive on M1 Finance and what they have to offer, so let's get started. When Brian Barnes graduated from Stanford in 2012, he had a hard time finding a tool with which he could invest in the stock market on his own. This prompted him to start his own online brokerage site, M1 Finance, at 25 years old.“What I was trying to do seemed relatively basic,” Barnes penned in a recent post on M1's site. “I wanted to be able to pick my investments, and have recurring deposits automatically added to those allocations.”And that's exactly what M1, which has $60 million under management, allows users to do. M1 users can pick the stocks they want to invest in and then they can determine what percentage of their portfolio they want each position to make up. M1 automatically updates as you put in more money and as stock prices fluctuate to maintain your preferred portfolio allocation. So if you want Apple to make up 25% of your portfolio, M1 will balance your portfolio as such. That means you can't buy one Apple share, or one Amazon share. It's all about the portfolio. M1 Finance gives you the automated investing tools of a robo-advisor, with the fine control over your individual investments like a traditional brokerage. The cost for using M1 Finance is pretty darn cheap. It's FREE to use the basic service! So let's get into the details. Build Your Portfolio: M1 Finance's “Pie” portfolio concept will be introduced, and you'll walk through the process of creating your portfolio. Start Your Brokerage Account: Choose your account type and complete your profile details for your account. Deposit Money Into Your Account: Link your account that you'll use to fund your M1 Finance account. There is no minimum amount to open an account, but to invest you'll need at least $100 in your account. Personally I decided to drop $1000 in there right away to get started. Your free account can be opened through the link below. M1 Finance is one of the most flexible robo-advisors available at this time. Many robo-advisors will give you the option of only a few pre-built investment portfolios, ones they've built for a general audience. Usually the only changes you can make are to the ratio of stocks to bonds included in the account. M1 Finance gives you granular control over your investments if you want it. M1 Finance has an investing concept that they use where they call individual investment portofolios “pies” . Pies are the basic organizational structure for your investments. The pie can have as many as 100 slices to it. Each individual slice can be an individual stock, an ETF or even another set of investments via another pie. Each slice that you've added to your pie is assigned a percentage of the total pie, and when dividends are paid out, or funds are added to your account, the system will do it's best to ensure that the percentages stay consistent. If you're not adventurous and want M1 Finance to do the work for you, they have over 60 pre-built pies that you can choose from. Want to choose one of their pies and then add a couple of individual stocks to it? You can do that too! General Investing: Build a diversified portfolio that's based on your personal level of risk tolerance. Plan for Retirement: Invest in a portfolio that is tailored for you and your target retirement date. Responsible Investing: Invest in socially and environmentally friendly investments. Income Earners: Choose investments based on dividends and income returns. Hedge Fund Followers: Aims to emulate the strategies of successful investors and hedge funds with good reputations. Industries and Sectors: Invest in specific sectors like aerospace, biotech and more. Just Stocks and Bonds: Gives you a highly diversified portfolio with a total world stock fund, and a bond fund. Other Strategies: Other popular investment strategies that you can use to meet your goals. Once you have chosen a stock pie from M1, or have customized your own, the pies will now live in your dashboard. You can add as many (or as few) pies to your account as you want, with the one caveat that a “portfolio generally cannot hold over 500 individual positions“. Once your pies are built and saved in your dashboard, there are a few things to remember. All trades are made by M1 Finance at 9AM central on days that the New York Stock Exchange is open for business. Once the amount of cash in the account reaches $10, it will be auto-invested. 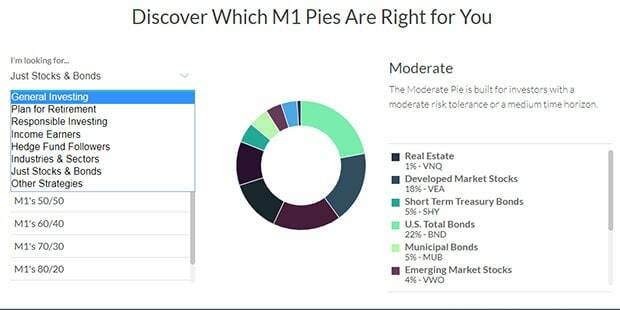 For every new contribution or dividend deposit, M1 will invest those funds into under-weighted slices of your pies, in order to bring them into balance. New contributions and dividend reinvestment will aid in automatic re-balancing . You can do a manual account re-balance as well through your dashboard, either on a specific pie, or on your whole portfolio. M1 Finance has well reviewed mobile apps available for both iOS and Android. I've tried it and it looks great! 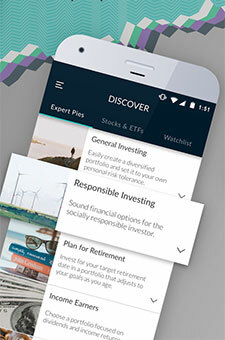 The apps allow you to do most things you can do on the website including creating your portfolios, setting up automated investments, re-balancing your portfolio pies, and more. 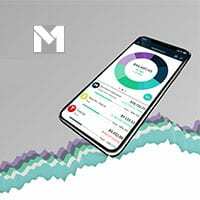 Earlier this year M1 Finance announced a new feature of their accounts that would allow you to borrow money from M1 Finance at a rate that is extremely low, 4%. How does it work? Let's say you want to build a deck on your house. You can instantly borrow up to 35% of your account balance at a low rate of 4% to make that happen. There is a caveat. Your brokerage account has to have a $10,000 balance or greater. 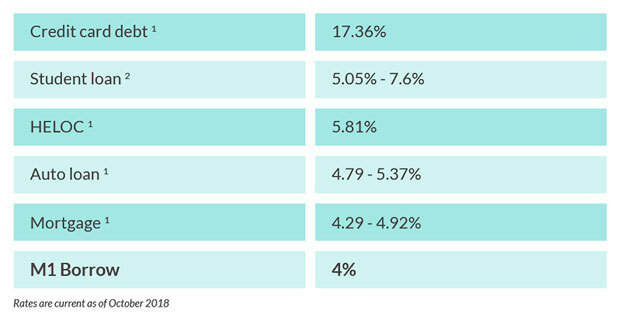 How does 4% rate compare when looking at other traditional loan types? It compares pretty favorably. The nice thing about borrowing from your account is that there is no paperwork, credit checks or application denials to worry about. Just have an account with $10k balance and you'll be able to borrow up to 35% of the balance at a rate lower than you can find in most other places. 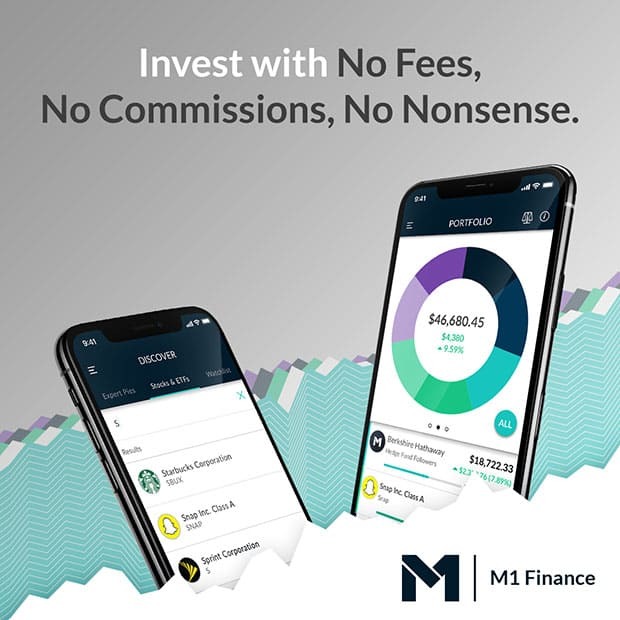 One of the biggest pros that M1 Finance has at this time is the fact that they are a fee free service, and there is no minimum to open an account. If you want to invest your funds there is a $100 minimum with a taxable account, and a $500 minimum for retirement (IRA / Roth IRA) accounts. That's still a pretty low bar for most folks. If you're looking for where some fees might reside, M1 Finance does have fees related to transferring funds via wire transfer, or to do a full account transfer out. That's pretty standard though, and regular electronic funds transfers (EFT) are free. To see a full listing of their administrative fees see their fees disclosure page. 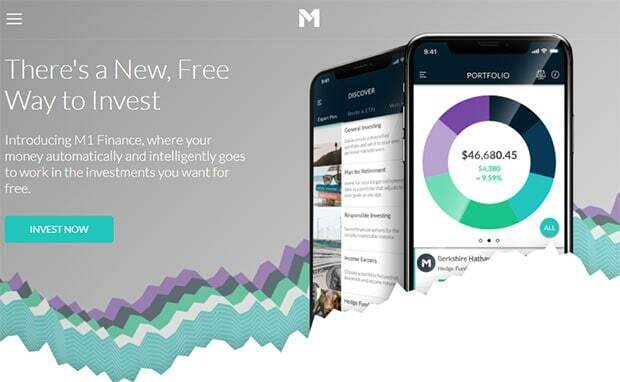 M1 Finance is a cool new investing platform, and it's one of the best I've come upon in the last few years. They're similar in some ways to other robo-advisor platforms in that you can deposit your money and choose a preset investment portfolio, and set it to auto-invest, but they're much more flexible than most. Not only do they have pre-built portfolios, but you can create your own investment pies that include any combination of stocks, bonds or other pies. Just find what you want to invest in and add it to your pie – there are no trading fees! M1 Finance is one of the more innovative, low cost investing companies available for regular investors. I recommend giving it a try. Open your free account through the link below. Get Your M1 Finance Account Now! Having a bank account is absolutely necessary these days. People rely on banks for many services. They use them to make sure all of their bills are paid, as well as having easy access to any money they've worked hard to earn. Many people develop a relationship with their bank. They rely on the bank not only as a place to store funds, but also as a place where they can seek out financial advice. A bank can help with other aspects of their lives, including financing a home and planning for retirement. A good bank can help them make important life decisions such as what kind of investing is right for their risk tolerance level and how to afford the house in the neighborhood they like best. While a great relationship with a bank is ideal, sometimes this relationship isn't quite working out. In that case, it may be time to think about switching to another bank. The process of looking for a new bank may feel quite confusing. Many people have an idea of the kind of bank they want to find but aren't always sure what will work. It's a good idea to take the time to look carefully. Banks like https://www.oakstarbank.com/ can help. It's a good idea to think about the person's overall finances. People are at different stages financially in life. A young person just starting out may have concerns such as paying off student loans. An older couple may be looking ways to help them increase their savings and pay for retirement as well as ways to help to pay for any ongoing medical bills. Each person should think about the kind of financial issues that impact them personally. This includes mortgage interest rates, money market interest rates, their personal debt load, and their ability to access their funds as soon as they need them. It also includes things such as the location of the branches near their home or place of business and the amount of money they need to keep in the bank account in order to avoid having to pay fees. Each person should site down and think about what they're looking for in a new bank before they start. A bank offers many different kinds of services. 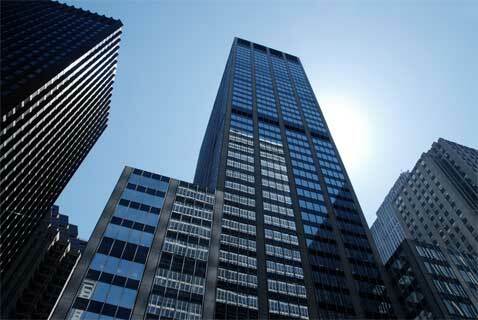 Banks offer mortgage loans, personal loans, and loans to start a business. A bank also offers help with opening money market funds and other kinds of savings vehicles. Banks provide people with the means to learn about the market and discover how it can work for them. Many customers are looking for banks that offer friendly services from highly-trained staffers. They are seeking out advice about this crucial area of their lives. Staffers can show people how to open up an account. They can also help them order checks, make sure any savings are transferred between accounts, and demonstrate the right mortgage for their personal financial background. A bank can also show people how to open up an account they can access online and how to make sure their paycheck is directly deposited and all bills are paid electronically from the account and on time. All of these services help the client create a firm financial base from which to use their funds most efficiently as well as make important plans for their personal financial future. Switching banks is a highly personal decision. Doing so, however, can bring rewards. Banks love to bring in new customers, and many offer incentives of all kinds to bring people in. Things such as lowered or no fee checking, or even useful gift cards. Bringing one's business to a new bank offers the opportunity to establish new connections that are useful for the client and allow them to find a bank that works better for their current needs. A person's life circumstances can change rapidly over time. They may have a new baby or a new job in a new city. They might have moved to another neighborhood. It's a good idea to periodically consider the person's banking choices in the process. Help from a bank with staffers who are dedicated to providing superior customer service to all customers allows the client to determine the very best course of action for their deeply personal fiscal life situation.